As often as not, it is reading great writers that inspires one to want to write and as a writer, I'm given over to professional admiration (as opposed to envy, which I never, ever...no, really...never, ever succumb to...) when I come across a really well-written, well-conceived novel. 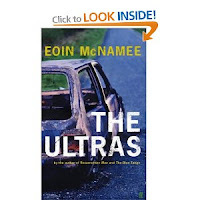 One such novel I read this week and it is The Ultras, by Eoin McNamee. 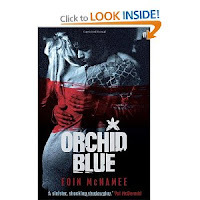 Having the honour of being mentioned alongside McNamee in a couple of reviews as a writer of serious historical crime fiction, I figured I'd better read a few more of his books. I had read his debut, Resurrection Man, when it came out some years ago and had been mightily impressed, though less so with the film version, which I'm afraid somewhat coloured my memory of the book. Orchid Blue I read last summer and was blown away by it. It is crime fiction in the loosest but most serious sense, and the highest of art in every other. 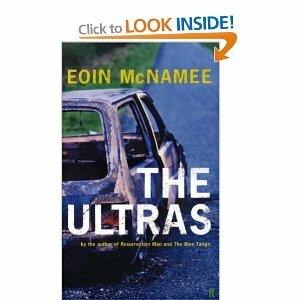 Thus when I came across a copy of The Ultras in our local bookshop a few weeks ago I snapped it up and am pleased to report it is much the same in terms of quality. It is this endless realm of the possible and improbable, of knowable and unknowable, that is the concern of the novel. In life, nobody knows (or nobody is saying), in fact, what happened to the real Captain Nairac or any of his handlers--if he indeed had them--other than that Nairac was last seen drinking in a remote pub called the Three Steps Inn in South Armagh and was never heard from again. Teeth and blood were found on a local bridge. Reports of late night, cross border visits to a local meat factory are common. Statements were made by 'witnesses' at a local RUC barracks with a reputation as bloody and brutal as that of the abattoir to which it is said Nairac's body was taken. Men have been tried and convicted of murder though no body has ever been found. McNamee's brilliance lies in the way he constructs a novel about the construction of myth as historical record. What is history, he appears to ask, when no one knows anything and those that do are dead or fear death if they tell what they know? What is history when those in charge of the record construct it to justify the most invidious of political aims. Here is one passage which does this amazingly well. In it, a low level British spook is tasked with justifying the internment of republican suspects selected by his sinister boss. He is creating historical record of the most unreliable kind and it is just such history that McNamee addresses in all its mire of misinformation. Buy it folks. McNamee is one of the finest writers of historical fiction working today in any country. His books aren't comfortable, or easy. They are not the kind of novels to end nicely. They do not restore your faith in the good of humanity and the power of the noble, if flawed, policeman. They are also profound, beautifully written, brutal, nuanced and often brutally sad. The Ultras and Orchid Blue also happen to be just plain brilliant.